NOTE: I mislabeled the x-axis in the orginal charts in this post as "months since formation". They should have been labeled "quaters since formation". Thanks to Brandon Watson for pointing out the error. I’ve changed the charts and they are correct now. It’s Christmas time and I’ve been thinking about gifts. In this case, I’ve been thinking about what a gift the evolution of the web from its first generation to its second generation has been to the venture capital business. Yes, I’ve read all those posts (and have even written a few of them myself) talking about the capital efficiency of building and deploying a web service these days. And it’s true that it’s getting easier than ever to start a company without needing venture capital. So many have posited that web 2.0 is a threat to the venture capital model. I think that’s totally wrong. Web 2.0 is a gift to the venture capital business and I’ll explain why. I’ve been investing in web startups for over 10 years. I was a very active investor during the first incarnation which we now call web 1.0. And I’ve been an active investor during this incarnation, which we now call web 2.0. I’ve been involved in more than fifty web startups through Flatiron Partners, Union Square Ventures, and a number of angel investments. And I have paid close attention to the capital requirements of all of these businesses. When you write the checks to keep the project going, you generally have a good sense of how much it all costs. Back in the late 90s, you had to build everything from scratch. The LAMP stack wasn’t the obvious platform it is now. There were no off the shelf commerce solutions. A content management system cost a million bucks or more. Streaming video meant huge license fees to Real. Web servers from Sun could force you to do the next round of financing. And it always seemed to take 20 engineers or more to build whatever it was you wanted to build. At a minimum, you were looking at $5mm in first round venture financing just to build the service. Then you needed another $5mm in second round financing to launch and market the service. Back then there were no blogs which could tell the world about your new service. You had to do expensive PR, marketing, and the expensive anchor deal with one of the portals that ended up bringing you no traffic but still cost you millions. If you did all of that well and built a large audience for your service, you then needed to build a business model (ie revenue). So you went out and hired a salesforce to sell whatever it was you were going to use to monetize (ads, subscriptions, licenses, etc). That meant a third round and at least another $5mm. And if you got the revenue flowing, you’d generally need one more round of financing to carry you to profitability because the expenses were going out the door faster than revenue was coming in (they call that "working capital needs"). So you went out and raised another $5mm to get you there. Best case in web 1.0 world, you could get profitable in four years for a total of $20mm. It almost always took more, but regardless, my main point is that the capital requirements were linear over time. Five million per year for four years. The chart looks like this. Much of that story has changed in the past six years. The bubble burst and it was the best thing that could ever have happened. Web entrepreneurs were forced to figure out how to build stuff for less (a lot less). The LAMP stack emerged as the platform of choice. The MBAs and big company types who invaded startup space in the late 90s went back to "real jobs" and the only people left were hackers and geeks who knew how to write code themselves. And so they did. They formed small teams of two or three people and built some really important web services initially by themselves and a few friends/colleagues. What they figured out was how to build a web service for less than couple hundred thousand dollars (more than an order of magnitude less than people were spending at the top of the first bubble). At the same time blogs emerged. They were initially a new form of self expression, a merging if you will of the role that forums and personal homepages had played in web 1.0. But they were quickly adopted by the same community of geeks and hackers who were building the first web 2.0 services and they became a way for people to tell each other about new web services that were being built. Because blogs are link heavy they generate traffic. And they also are search engine optimized. So Google + Blogs = Traffic. And that formula has been perfected to the point that it no longer requires an expensive PR firm and a portal deal to launch a new web service. You start with the blogs and go from there. I’ve seen some of our web 2.0 companies get more traffic from blogs in one day than some of our web 1.0 companies got from expensive portal deals in their entire existence. The net result of these two fundamental changes is that you can build AND launch a web service in less than a year for less than $600k. And so many have done it that its not even worth pointing to examples. They are everywhere you look. That’s the story that’s been written. That’s the story that leads to the "web 2.0 is a threat to the venture capital model" theme. But as I sit here at the end of 2006, with a portfolio full of web 2.0 companies that are growing and thriving and expanding, I am going to tell you a story that hasn’t been written (at least I haven’t seen it). And that story is that some things don’t change about starting a company. It may take only two or three great developers to build and launch a web service. But it still takes a bunch more to maintain it, develop it from there, deal with scalability, deal with feature enhancements, take the service in new directions, respond to competitive threats, etc, etc. Two years into the creation of a web services company, you’ll certainly have more than ten engineers on your team and you could be looking at closer to twenty. That costs money. Another unavoidable fact is that customers are expensive. They require service. And you can’t provide customer service forever with a blog that most of your customers don’t even know exists. You have to provide email support for sure. And more and more web services company (certainly the ones who want to service mainstream customers) are moving to some form of phone support. And then there is that thing called revenue. You can launch with Adsense. That can get you to first base in the revenue ballgame. But you eventually need to go past that. There are other ad networks like advertising.com, TACODA, Tribal Fusion, FeedBurner, Federated Media, and others. They can bring you a lot more revenue but you are going to need to hire someone to manage all of this activity. And eventually you are going to hire your own sales force. Salespeople take time to get up to speed. Particularly the first couple salespeople who are doing missionary work. Salesforce = big time cash burn. It always does. Another challenge that a growing audience creates is scalability. What once ran on a single server and a T1 now requires twenty racks and more bandwidth than can be found in a single facility. And what about redundancy? So you open a second facility. And what about storage? Most web 2.0 services use data to deliver a compelling experience for their users. But you have to store all that data somewhere. I see more money going out for storage hardware these days than almost anything else. Yes, you can use Amazon S3 and I would encourage everyone to do so, but that alone is not going to solve all of the storage problems out there. Before you know it, you’ll be consuming cash like a web 1.0 company. It is already happening in the most successful companies in our portfolio. 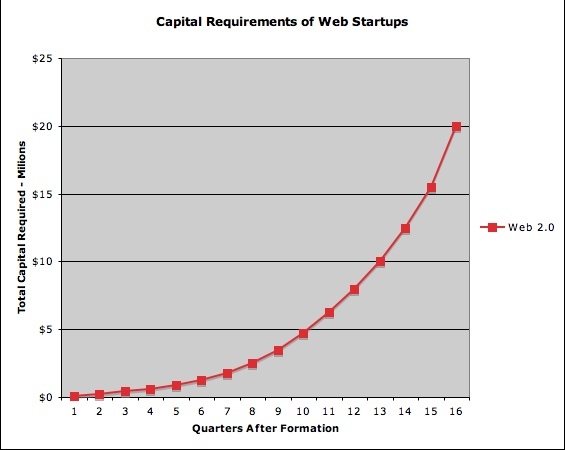 The chart of capital consumption of a successful web 2.0 company looks like this. So maybe it still takes $20mm to get a web startup profitable? I think that many can and will do it for less. And few web 1.0 companies were able to do it for $20mm. So I am taking some liberties here. But it’s mostly to make a point. And the point is this. 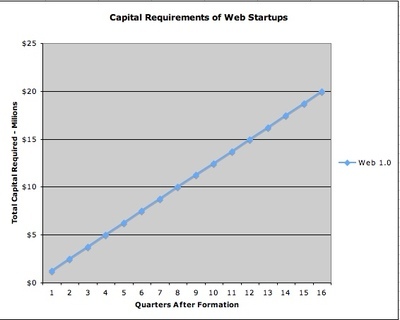 Venture capital still plays an important role in financing web entrepreneurs. But the need for capital comes later in the company formation process. And that is a very good thing for everyone involved. Because VCs can scale their capital (ie risk) exposure as the risk is mitigated from the opportunity. They can still get their $10mm per deal invested, but they will put less up at the start and more up later. And its better for entrepreneurs because they are going to keep more of the business because they will dilute less in the early days when the valuation is lowest. And, of course, entrepreneurs now have the opportunity to cash out before they have taken a lot of venture capital. You can see my point if I overlap these two charts. All that area between the red and blue lines is risk that has been taken out of the equation for VCs and equity that should largely accrue to entrepreneurs. It’s a huge gift to the entire web startup ecosystem. Given to us by the people who toiled in the "nuclear winter" creating a new model for building web services. We owe them a great big thank you. So how do you play this new curve if you are a venture capital firm? Well there are a number of approaches. There is Paul Graham’s Ycombinator that makes rent money available to hackers who are building new web services in return for a small piece of equity. He’s doing a lot of them and playing the numbers game. There is CRV with their Quickstart program where they make loans for the initial startup money in return for a pole position on the next round. And there is First Round Capital‘s model which is largely that of a seed fund with staying power. At Union Square Ventures, we take a pretty traditional approach to this opportunity. We are going to invest in just about the same number of companies per year that we would have invested in during the 90s. That’s two to three per partner per year. That number has worked well in the early stage venture capital business for a very long time. But we are going to start with smaller amounts. We’ll invest between $250k and $1.5mm in the first round. And then scale up our investment as the companies need require it. I think we’ll get $7mm to $10mm invested in our best companies over time. But we’ll do it in a way that lets us take less risk in the early years when the opportunity is not fully formed. And that is a gift for which I am very thankful for this holiday season.